…and here’s how I solved the problem. 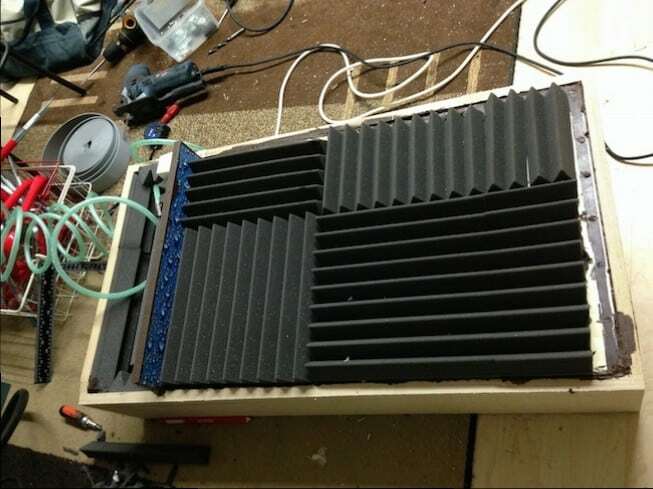 I built a soundproof box for it. 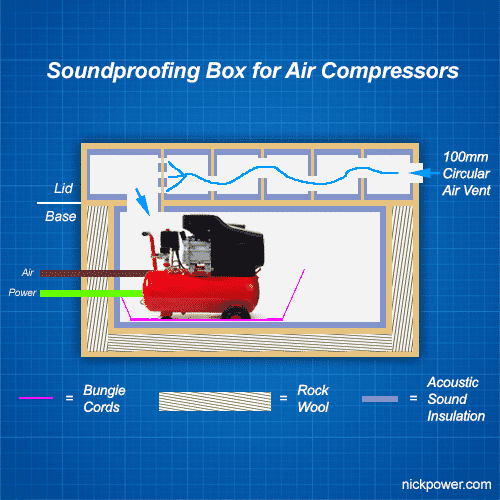 This is what my design of an air compressor soundproof box looks like finished. The orange straps keep it together tight and it’s placed upon wooden blocks until I get some decent castor wheels. 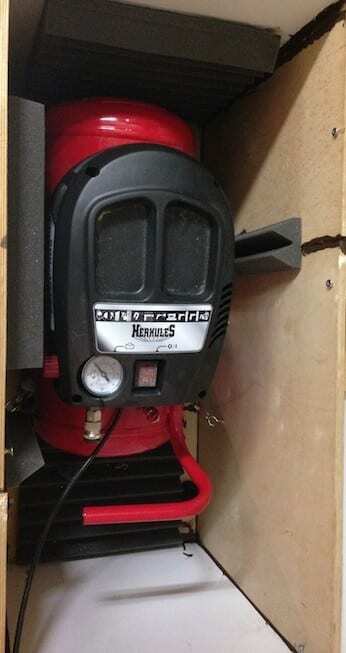 To be honest, when I was designing and building the box, I had some fears that it wouldn’t be very effective – for example, the compressor I have is simply noisy and there wouldn’t be anything I could do about it. Saying that, I soldered on and with a bit of science and thought into the design, things worked out and here’s the results. Daytime ambient workshop noise 40-50db. 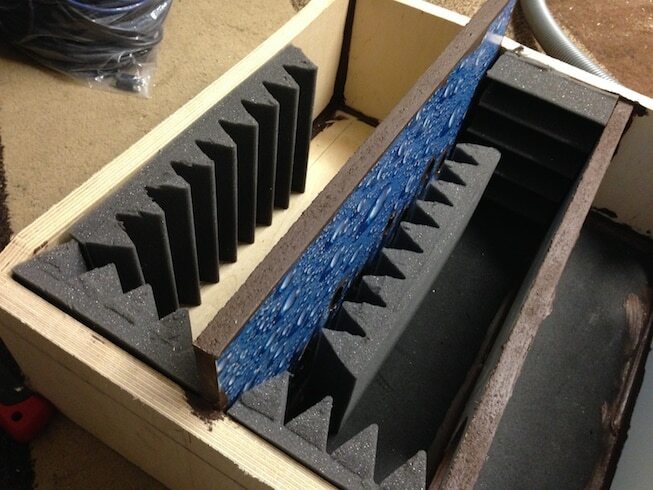 My box design reduces compressor noise and dampens frequency ranges roughly by 30db. Enough to be able to talk, converse and hear the radio playing whilst it is running. and… I’m no longer worried at least for the neighbours sake!! I realise the design isn’t absolutely 100% perfect and there are some improvements to be made but it’s a good first build on the project and I am very pleased with the results- after all, I didn’t spend that much on the materials required for building it; just my time, supplies and some recycled wood. There is no heat ventilation but that’s not important in my case because I use the compressor sparingly. It’s pumps at least 4-5 times from empty and it gets warm inside but it’s no way too hot to cause any problems. If I was to make an improvement to the design, I’d make another dampened outlet for hot air, the other thing would be to have some kind of cooling device inside. 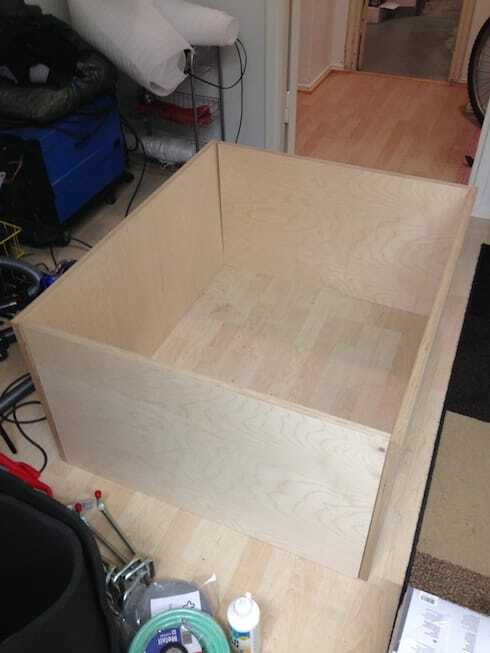 Have an outer box structure containing an inner chamber to hold the compressor. On top of this will be a lid that has a muffler style channel allows the movement of air. 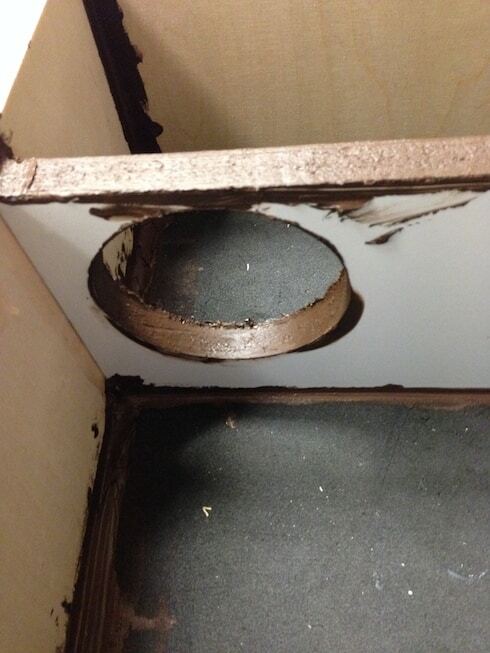 Outer box is ‘air tight’ using glue and sealant to prevent sound travel and leaks. Additional to this the inner box is ‘air tight’ to reduce sound travel into the void between the outer and inner chamber. The void is stuffed tight with rock wool cavity. 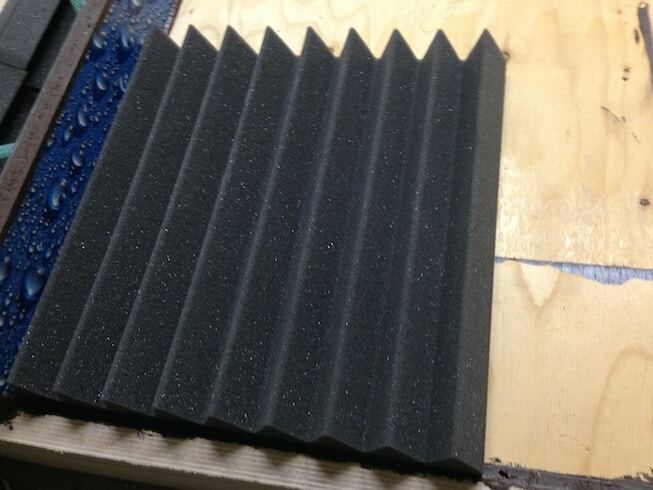 Sound treatment foam boards used where possible to minimise mid and high range frequencies. 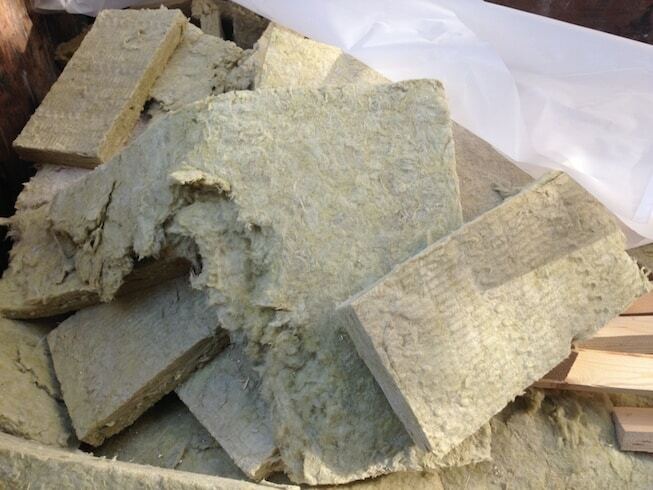 Rock wool used to reduce bottom and mid range and reverberation in the box. All chambers independently sealed to isolate sound. Air compressor is suspended using bungee cords (prevents vibration and reverberating), although I found some nice bed springs that I might install to replace. Air compressor pulls air in through a purpose built complicated air path, works similar to a exhaust car muffler. Cut and prepare four pieces of 3/4 inch (~1.9cm) thick plywood. 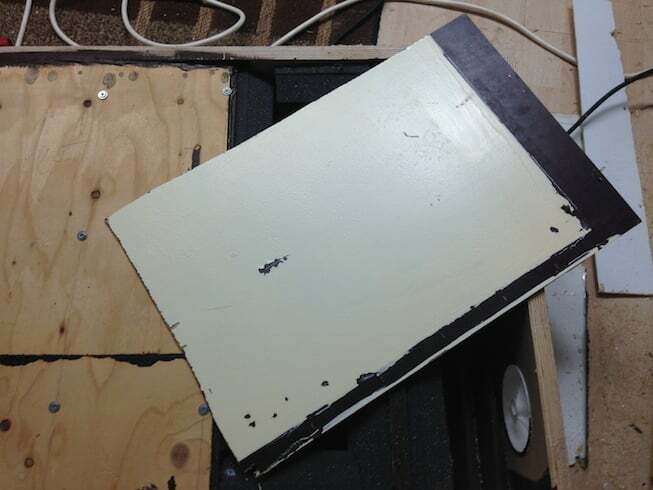 Here are the full-size square frame plywood sheets. Cut with a straight saw or perhaps get your DIY store to prepare them for you so you have four pieces. Thicker the sheets the better but bear in mind the weight – it gets heavy… You need two pieces of same length, then another two pieces of same height to create the rectangular design or you can choose the same metrics for all pieces to create a sqaure, it’s up to you but I didn’t want the box getting to big in my workshop! The width should be the same for all pieces. Just bear in mind we’ll be cutting a lid from this. I can’t really tell you exact measurements, you will need to decide exactly how long the pieces are, the measurements are based on the height and width of your compressor + 20-30% and give allowance of space between the machine and surrounding wooden panels. The 20-30% is the allowance to cut a lid. 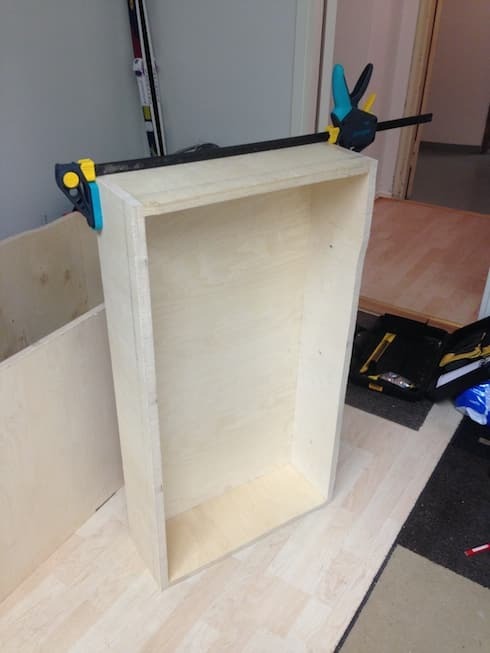 Remember to subtract the thickness of the panels from the height if you want the box to be perfectly square, otherwise cheat and use a router! 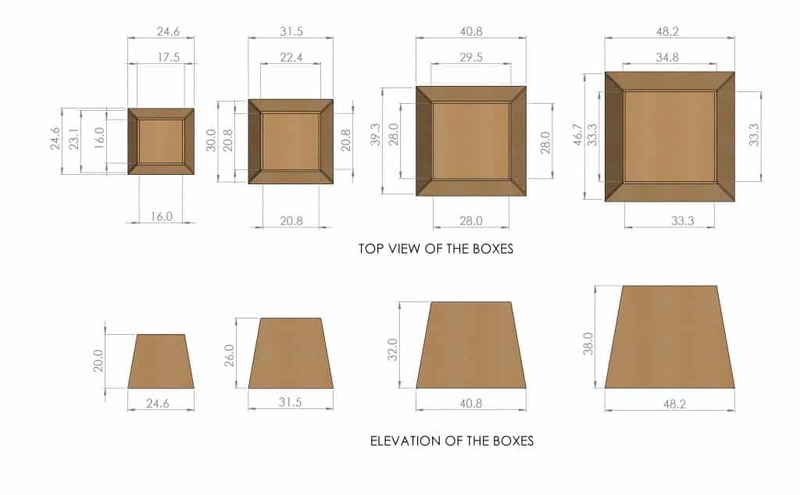 Here’s one example of working out the box dimensions. In addition to the four pieces, you obviously need two side panels to complete the box. You can lay one side on the floor, then start glueing everything together, only do one side for now and use a super strong wood glue. To be honest, any standard or strong wood glue should work a treat, I used a ‘strong’ wood glue. Leave the glue for a good 24 hours. So in the picture you’ll see I’ve laid a side on the floor and glued the side panels together standing up on the side. I’ll do the other side later on. 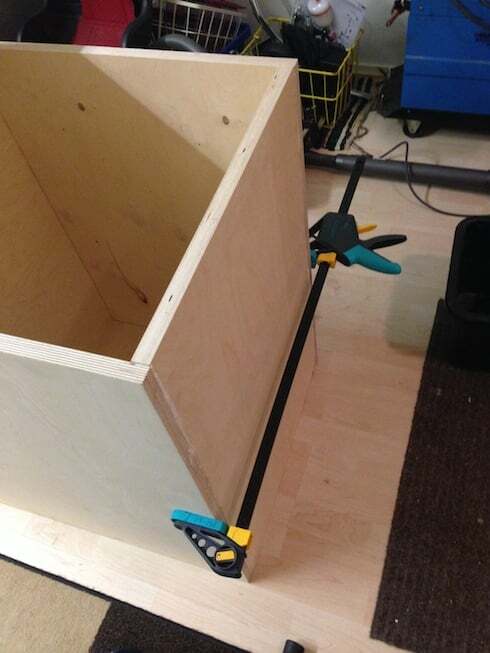 If you can get hold of a clamp, use it to prevent anything moving or slipping until fully dried. Once the glue has dried, check everything. Make sure there are no gaps – we obviously want this to be integral as much as possible. Moving on, it’s time to cut the lid. Check your measurements and make sure you give enough room for your compressor. I was aiming to have a 100mm vent path in the side, so I know straight away, I’d need at least say… 150-200mm height in the lid. Cut the lid with a straight circular saw or use a jigsaw. Glue the second side panel to the lid. Now it’s time to glue the other side panel. Glue, clamp, put it aside for 24 hours. 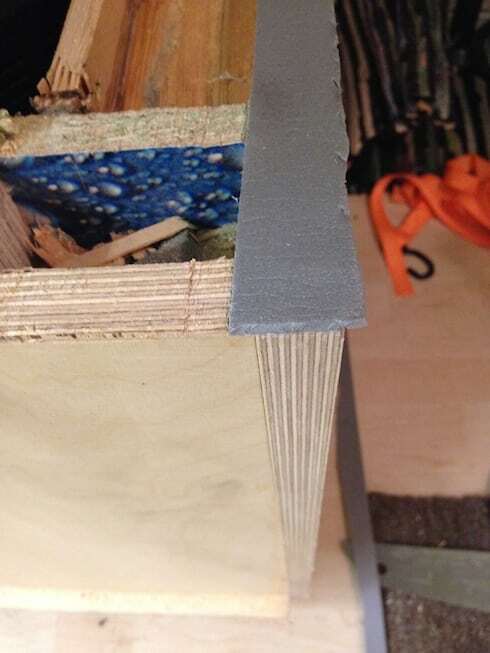 When the glue has dried, you can use a router if you have one to straighten the edges of the box so that when the lid is placed onto the box on finish, you have a nice straight fit without any gaps. 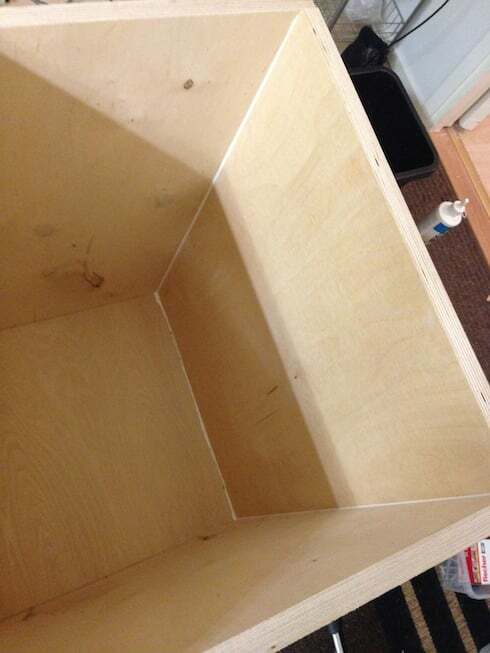 Take a little effort and time to complete this part of the box project. The picture shows the insides of the box and this is what we want to achieve. Here’s the lid just before completion, it shows you the air path. The blue panel is taller than the others and is a part with several small holes instead of one 100mm hole, you’ll see later on what I mean. The first thing we need to do is install some thick insulating mat to the lid. The type of thing you’d expect to be uesd as a gym exercise mat. This will add some extra sound treatment to the lid before we start installing the 5 panels needed to make up the air path. 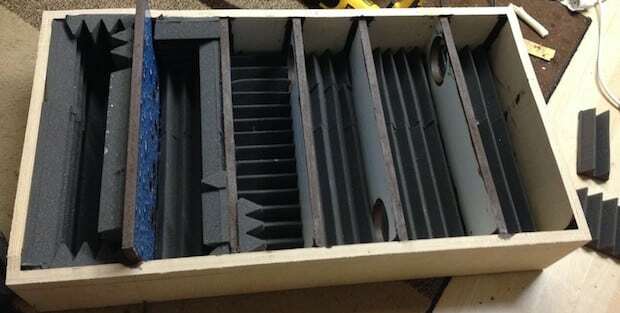 Cut and install some soundproof mat to the lid. 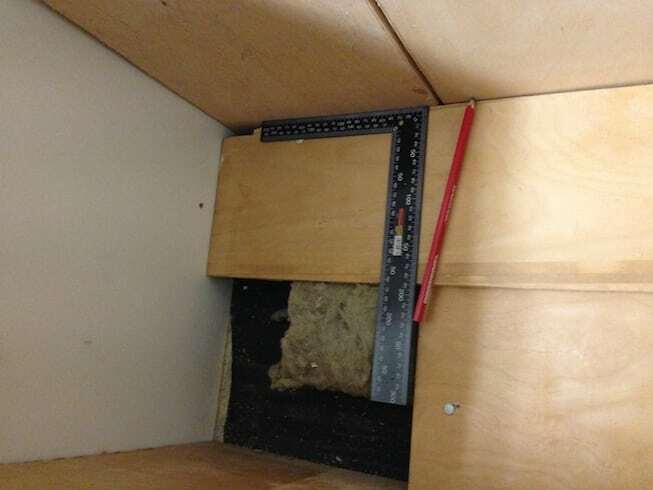 A quick note: to seal the lid air path effectively, we’ll use panels (mine were about 1/6 inch 4mm), so make sure you give enough for the panels to lie over the passage and meet the edge of the plywood square. It doesn’t have to be completely spot on since we’ll seal it with sealant but the closer the better. One panel on the left installed and another being prepared. I used two because I simply recycled a couple of spares in the workshop but you could measure and cut one length. 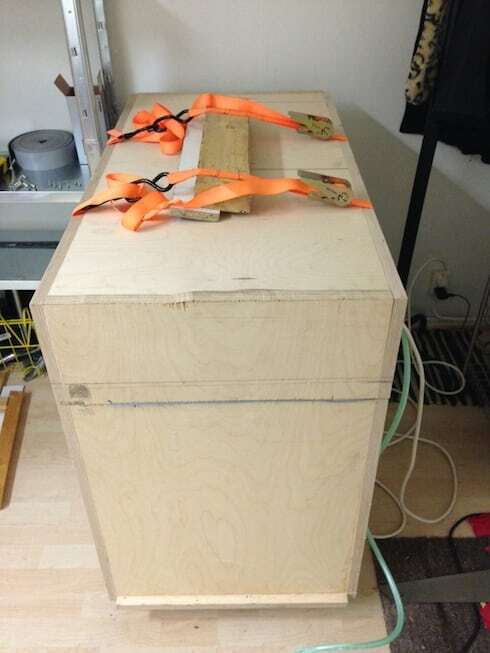 The first thing to do is to cut 5 equal pieces of wood that fit inside the length and height of the lid. Anyway, cut away and try them for size. Sound mat has been installed and glued but I didn’t have enough for the hole box since my piece was recycled but now trying out the panels. 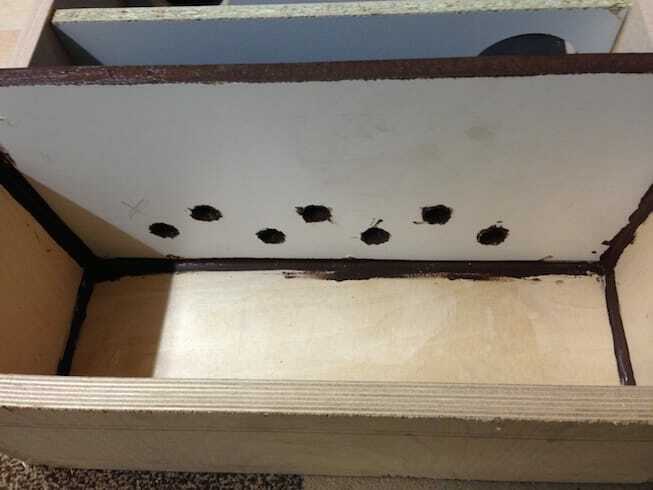 Then when you are happy, drill 100mm holes in the panels and begin to glue them into place. The bigger panel needs to have several smaller holes, I drilled 7 smaller holes (not shown in this picture but further down). 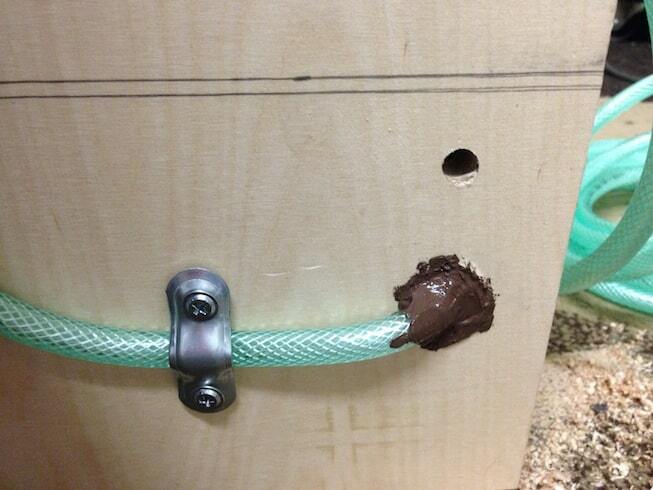 When the glue has hardened, start applying sealant to all edges and holes in the lid. Any good quality sealant is good, the one I used was an outdoor weather proof used for sealing gaps between doors and windows to brickwork. 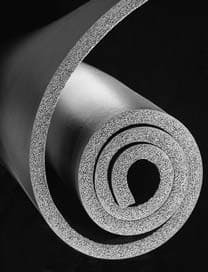 There are acoustic sealants but the stuff I used here is still very effective and cheaply available. It’s very flexible too even when dried and not messy or nasty to work with. Here’s the seven holes I mentioned earlier, drill several small holes here. Get in every crook and cranny. There needs to be a good seal here. Once this is done, we are ready to start applying the sound treatment boards. 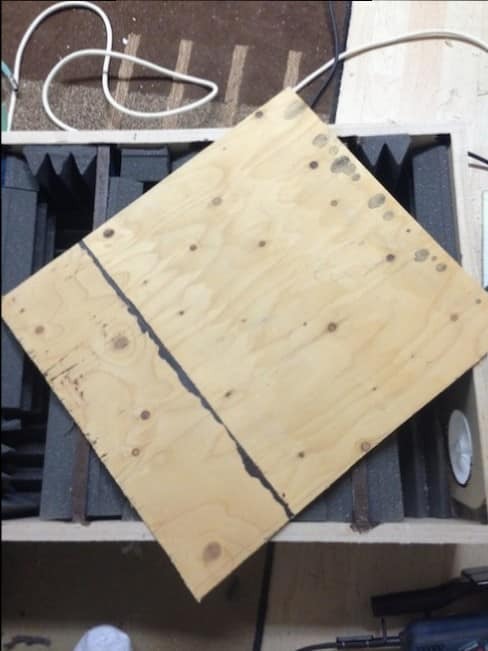 Sound treatment boards are easily available from the internet and I ordered a large box of tiles, about 30 of them. To install these to the lid, we’ll need to cut some up. It’s a time consuming process but the most significant and important part of the lid. 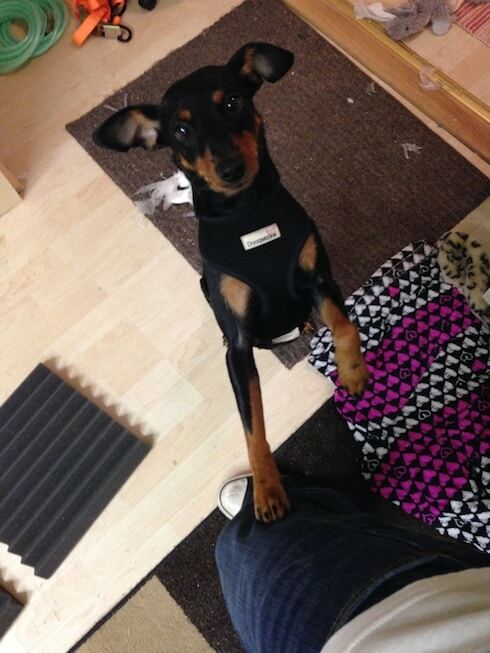 My dog is trying to tell me something…. Crack on with the measuring and cutting, every panel needs to be covered but don’t obstruct the 100mm air path and several holes. Panels can be applied to all visible sides. If you are wondering what the water droplets are all about, the panels are recycled chipboard shelves from a local corner shop which was being renovated and had been used I believe to be as shelving for refreshments in their previous life. Once you have finished cutting and adding the soundboards, a 100mm hole needs to be drilled with a hole saw at the end of the path. Then add a vent guard if you wish! This vent came with an adjustable cover although it wont really make much difference and it will always be open. 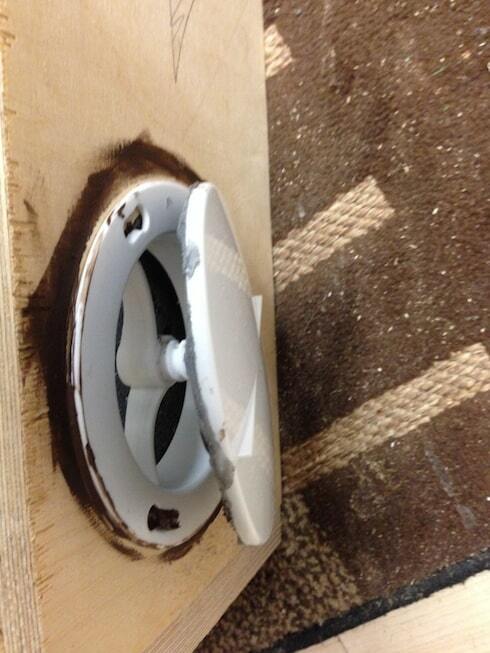 You’ll need to decide if you want the holes for compressed air and power in the lid or the base. At some point, drill two holes for air and power. 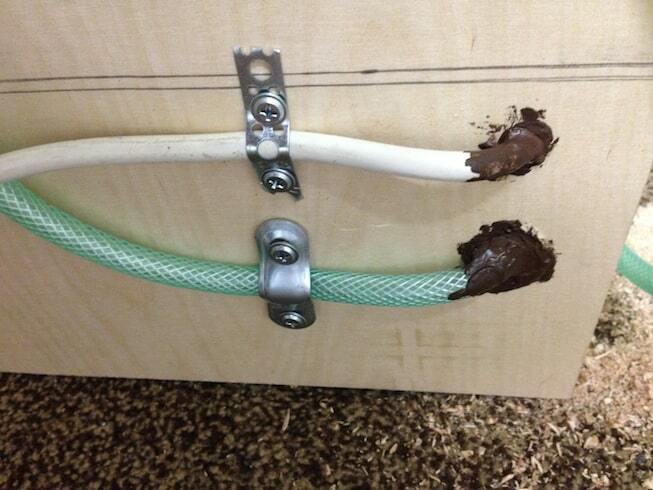 Install and secure and apply the suspicious looking brown sealant. For the power, I used a recycled power extension. Mounting a power extension inside. I decided to add the Power and Air holes into the lid. 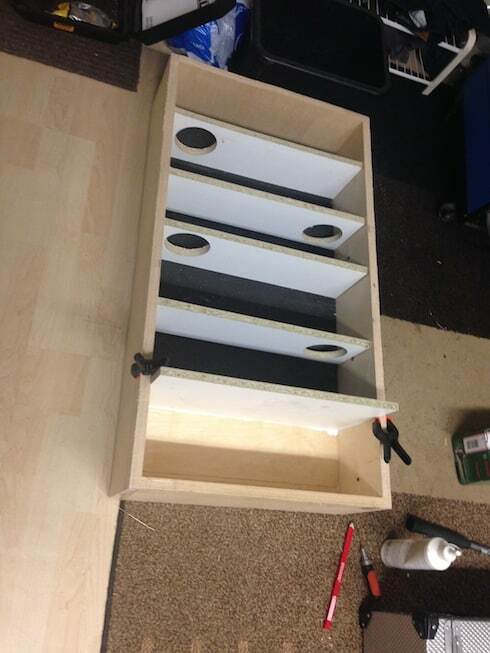 I just designed it this way, probably would have been better to make the holes in the lid side wall but there you go! Now it’s time to measure some panels and secure them to the top of the air passage. This is some thin plywood. 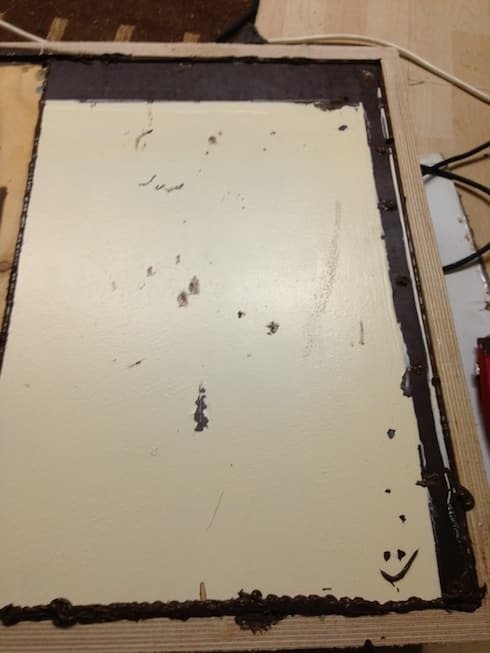 To secure the panels, I used a line of sealant on each panel. I will position and placed the panel half way across the beams. Then secure with washer screws. 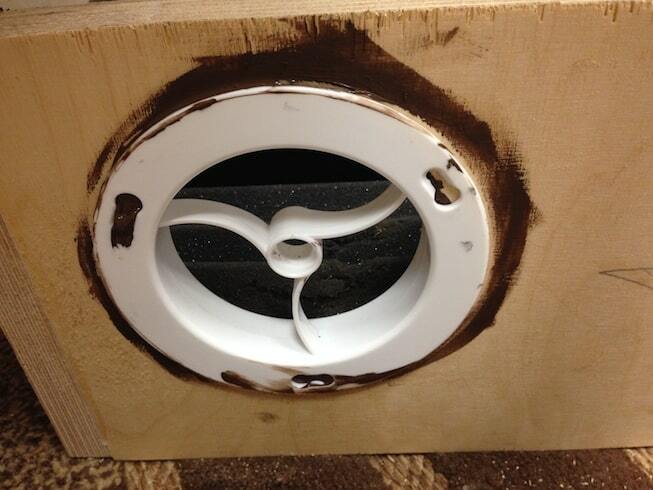 This will also help create and maintain an air tight seal in the joins. Onto the second panel. I used two panels because they were recycled and not very big, obviously one panel would be better. Use sealant around the edges and secure the panel with washer screws if needed. 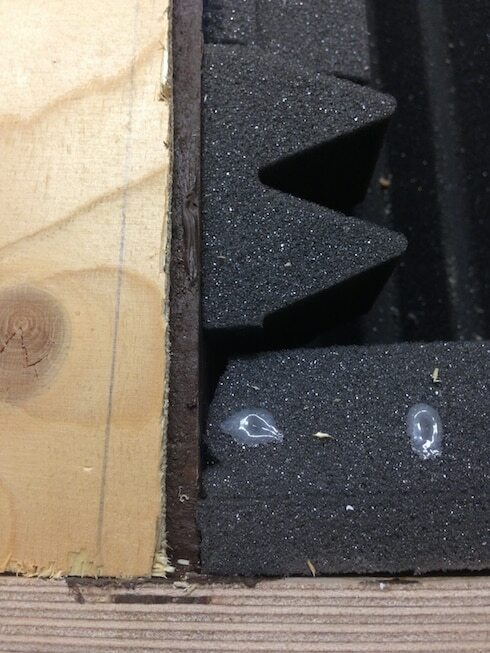 Then start covering the remaining surfaces with sound treatment foam-boards. Placing soundproofing boards on top of the plywood panelling. 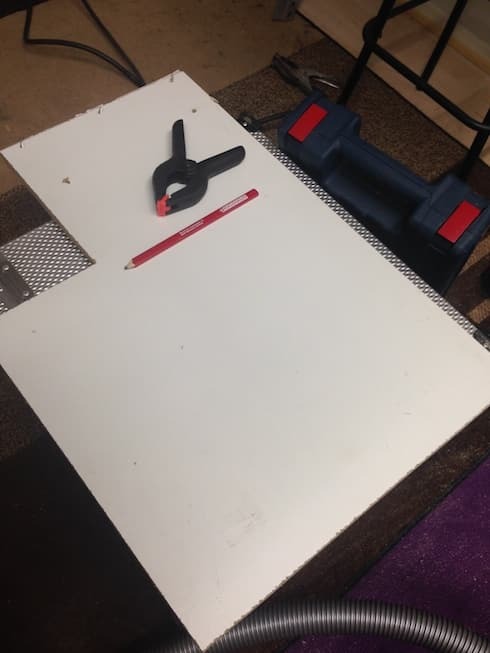 Keep foam-boards well within the edges because we need to make sure that the lid will sit into the base. Give yourself a pat on the back if you get this far, the lid is pretty much complete. When the lid is placed onto the base later on, you might need to make adjustments but we’ll come back to that later on. 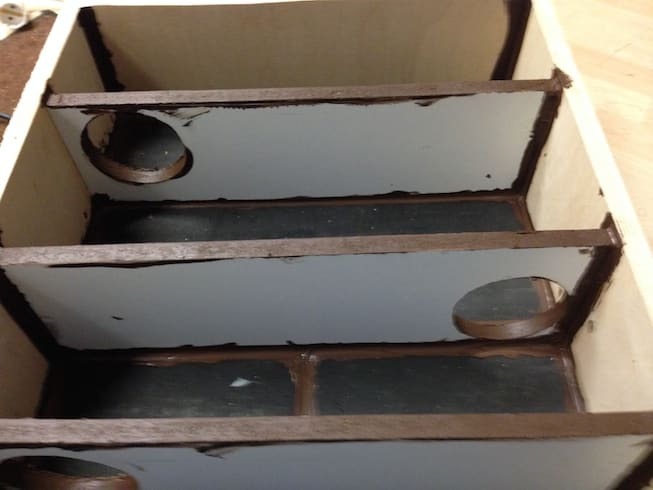 Now back to the base… it currently should look like this but with the glue hardened. 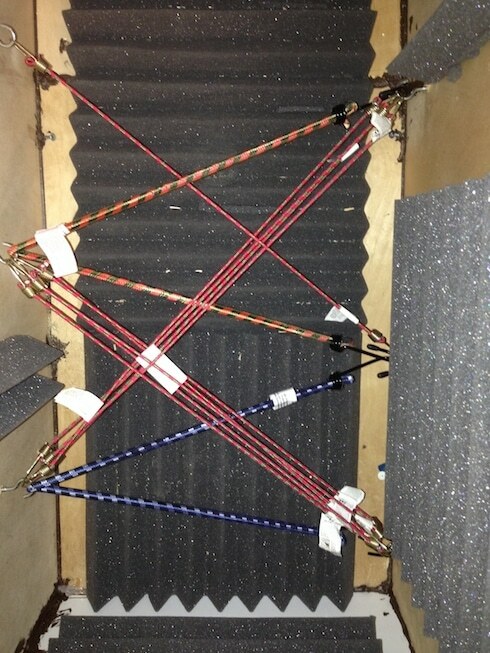 Next, take some more of the acoustic matting used earlier and place a layer in the bottom of the box. Give plenty of glue. 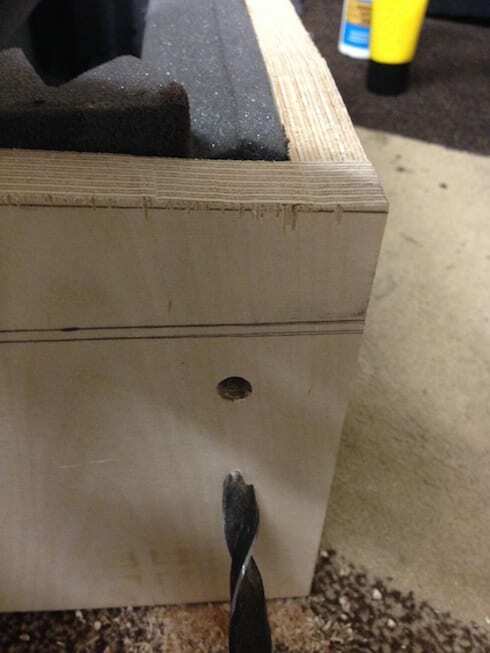 Placing the matting on the base will help to prevent reverberation of bottom end through the base of the box. Earlier, I mentioned the construction of the outer and inner chamber. There are probably better terms but what we are making is a box in box and in-between the boxes will be a layer of tightly fitted thick rock-wool insulation. 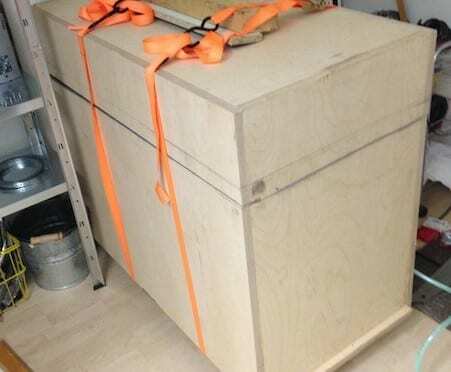 Lucky for me, at the time of building my box, there was an office renovation and there was plenty of rock wool insulation up for grabs. So I recycled some thick panels, like shown below. If you are recycling some too, avoid the broken ones if you can or buy a roll from the DIY/Builders shop and chop it into shape. 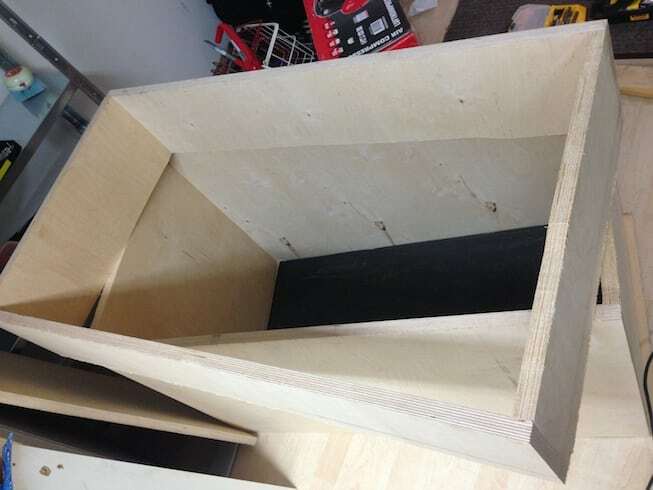 Take the rock wool panels and place into the box base and plan the construction . You’ll need to use plywood panels to create the inner box and ensure the rook wool is firmly pressed – reducing the air as much as possible in the void. You’ll see from the picture above that I’ve used plywood no more than half the thickness of the outer box and some chipboard. I recommend using plywood for the entire inside but I ran out of lengths since I was recycling materials. 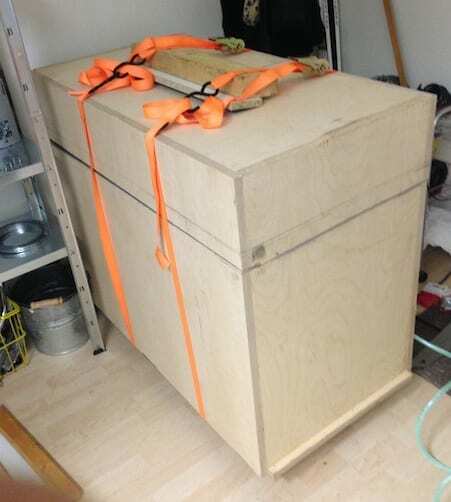 Use some long washer screws to hold the inner box panels into place and ensure the panels are pressing the rock wool firmly. You’ll notice that I created and placed a wooden cover ‘s too (shown on the two left and right sides). This part I guess is optional but I recommend it to give a better finished job and might help reduce the reverberation. 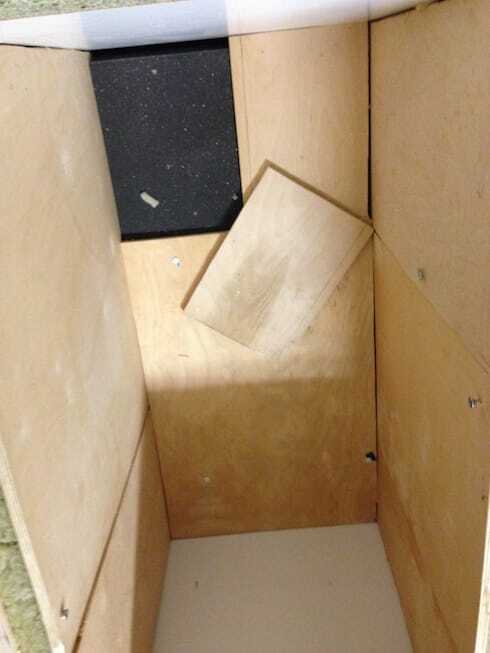 Then do the same for the floor (base) as shown below, cut the plywood panels to size and place rock wool underneath. You can add some more insulation if you have some left and/or the space. 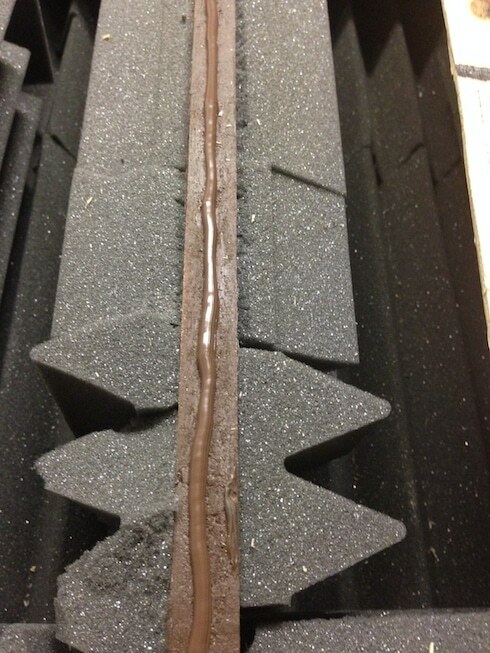 Then get the sealant out and run sealant in all of the gaps and lines in the box. Seal all the gaps and ensure enough is applied to seal. 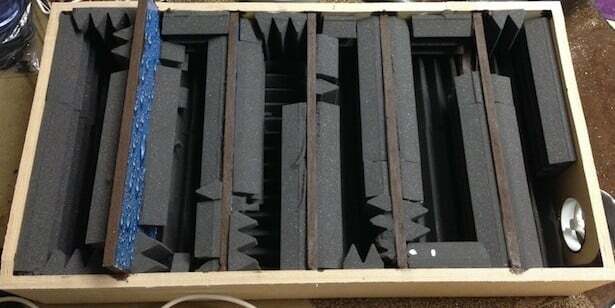 To stop vibrations, reverberation and external rattles, I placed some more soundproof tiling (if I’m honest, I would have covered the entire inside of the box but I had run out of tiles – possibly could have reduce a few more db’s). Anyway, in addition to this, I placed some hooks and installed bungee cords. The idea is to suspend the compressor rather let it rest on the surface of the box. This means I can get my hands underneath it to drain it and to prevent vibrations. EDIT: At the time of building, I couldn’t find strong springs but then I found some at a recycling centre strong enough to suspend the compressor in the box. I’ll now replace the bungee cords with these springs. 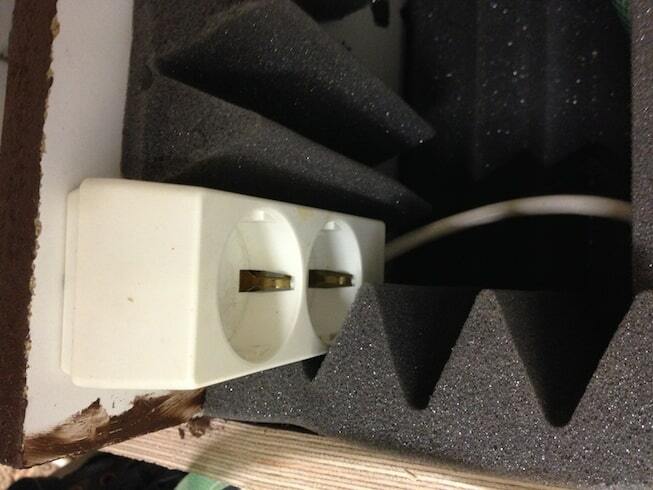 Plug everything in and make sure the box is clean from dust, wood, fibres, etc. The next job will be adding a layer of seal material to the box edges and placing the lid. I hold the box together by using two ratchet straps and fasten them tightly. The seal between the lid and base is a from a roll of plumbing heat insulation tap. One side is super sticky. Before applying the seal tape, run a router on the edges of the box, I still think this is worth doing. Keeping the outer box air tight is optimal. Cut up and apply some to the box. Use a Stanley knife to get the correct cutting and finish. Once this has been done, place the lid and lets hope it all fits together ;o). 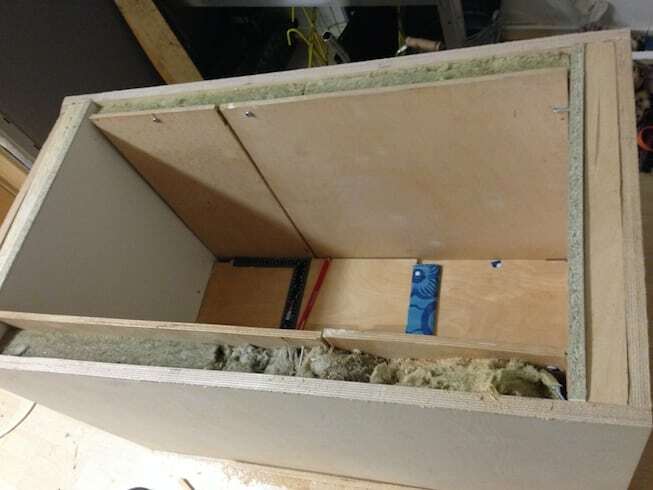 The main problem that I had found was that I had to adjust the large panel (with several holes) in the lid to fit between the inner box and the soundproof tiles which were obstructing. A little bit of chopping and adjusting here and there and I got a good fit. I placed the box onto some temporary wooden blocks but I’d to install some castors one day. So, there you are! I hope you found the post useful! Now I can get onto painting some bikes! I like this design. I made a sound box for my compressor 3 days ago using scrap wood as a tester. I never suspended my compressor like yours. I like the way you designed the lid. I have the same design where the air travels back and forth but I added a small separate box on top. When I remake mine using plywood, I’m gonna use that lid design. Not sure about my db levels, but it is working well. 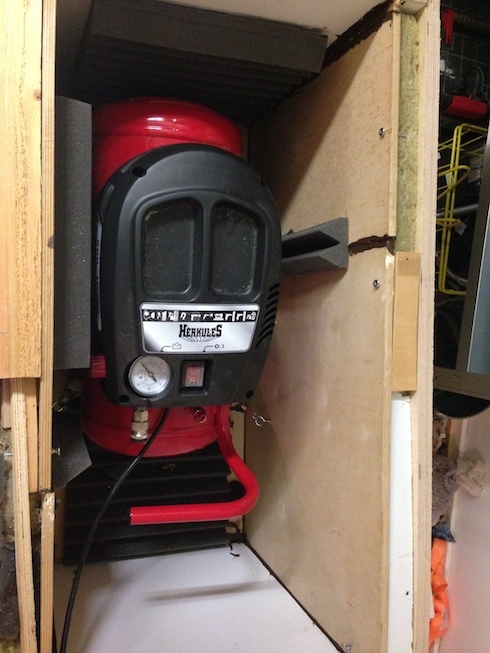 Love your design…but the amount of time and money spent building this thing you could have bought a quieter compressor. How does it stand overheating? It gets hot in the box after a 30 mins of running, but for me I use the compressor in short bursts which has been absolutely fine. I did think of modifying the box with a 100mm tube, inline fan and hot air outlet which would be very easy to do. Why everyone keeps thinking acoustic panels will reduce noise is beyond me. They split frequencies to prevent distortion and bounce back. 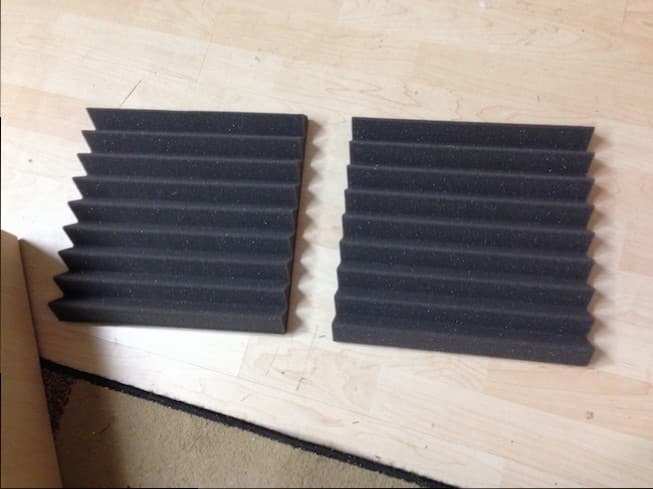 You can buy sound proofing, and this is for acoustics, not stopping noise. 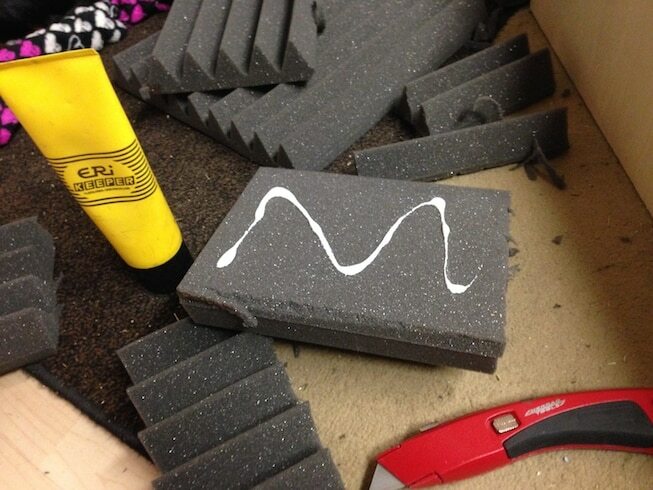 The box is doing all the work, foam pants are making the tone more correct! – woodwork, and I may try but with sound proofing instead. 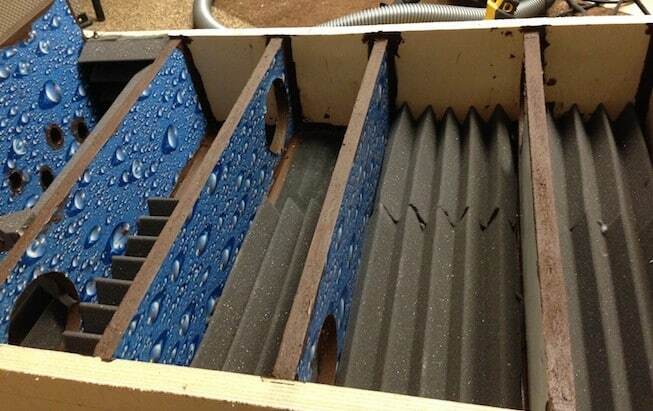 So John you think dynomat or some other sound deadening material would be a better alternative to foam tiles? My compressor is vertical, so I am thinking a box design that sits over my compressor and seals around the bottom on a high density PVC foam mat. Compressor is up top so vents can be at the lower extremes for further sound path baffling. Sorry, but there is one fault: The screws. They will get the Noise outside. Whitout them maybe you will have a silent box. That’ s a big Problem! 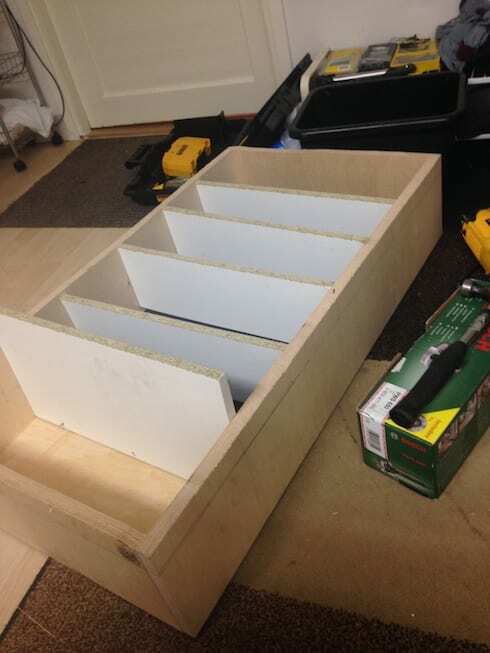 Make a box like the outer, put it in without screws to the outer Box and it will work very fine. Good point! I agree, could be an improvement if I build another box or decide to modify. The inner box could definitely be made better (without screws and full length glued wooden plywood sheets) but on this occasion it was made using recycled plywood shelving. I’ll have to keep an eye out for some wood and give your suggestion a try and report back if it makes a improvement. 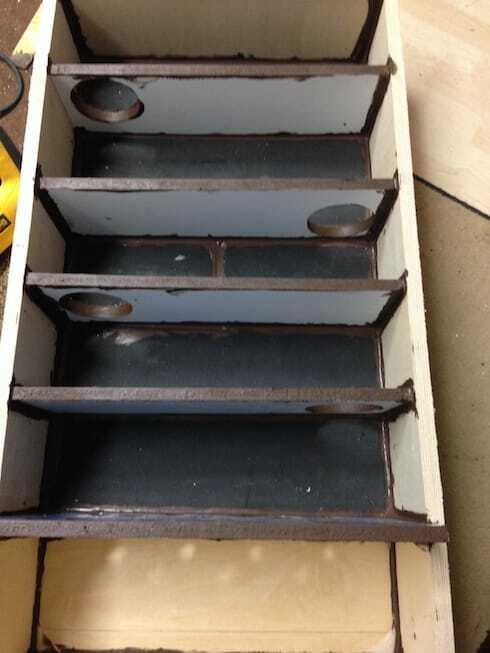 Support the entire box on springs rather than casters or wood blocks. This should gain a few dB in sound suppression. currently the entire box is transferring vibration to your shop floor. If you reduce by 3 dB you cut the energy in half. That’s a good point, it does make a difference. Something as simple as rubber type sponge feet (similar to a gym mat material) underneath. Works well. You could probably make a simple cuboid with the shutterboard or even use garden fencing to make a cuboid. https://www.amazon.co.uk/Marko-Fencing-Coated-Panels-Square/dp/B01H5AKJ12/ref=sr_1_14?ie=UTF8&qid=1529049294&sr=8-14&keywords=square+mesh+garden Use something like cable ties or hinges to attach them together: Then line the cuboid with rubber matting: https://www.amazon.co.uk/etm%C2%AE-High-Density-Rubber-Vibration/dp/B01B51TZF8/ref=sr_1_9?ie=UTF8&qid=1529048991&sr=8-9&keywords=washing+machine+rubber+mat You can buy rubber matting like this on rolls too if you need bigger sizes. 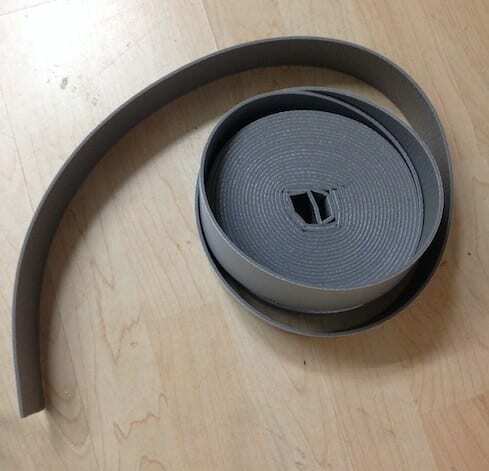 This material is easy to cut with a stanley blade for example. The garden mesh can also be purchased in squares typically. The fundamentals are that, you need to block the frequencies. The higher/mid range frequencies travel through air gaps very easily. 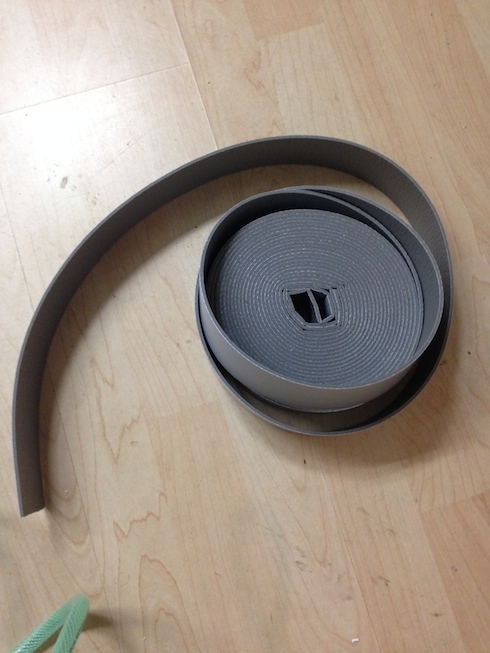 So I’d roll the rubber mat around, secured by the fencing (Shutterboard) and add a base and lid. Neighbour of mine made this and was very effective. Can I purchase this? 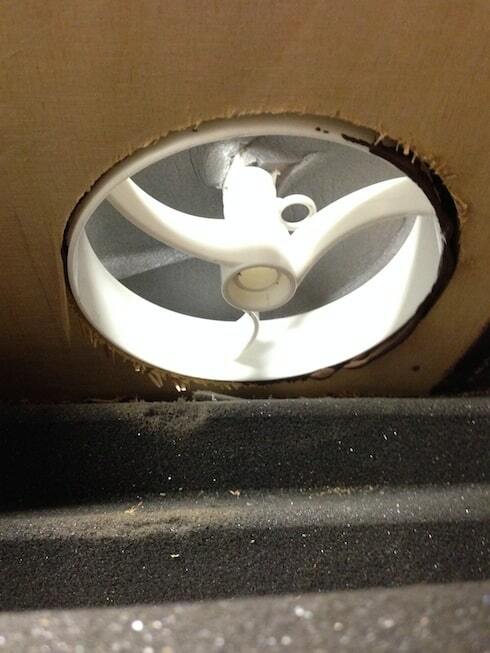 Do you know of anyone who can come to my office in Dana Point CA to soundproof the cabinet we have our compressor in? I could easily build one for you but logistics is a problem, I’m based in Finland!